In even the cleanest month, odor-causing molecules known as volatile sulphur compounds (VSCs) are constantly being produced by the natural breakdown of bacteria and human cells. Ordinary toothpastes and mouthwashes only cover up these compounds with a more pleasant smell or flavor for a few minutes. The VSCs are still there, causing odor in the mouth. However, the CloSYS ingredient in CloSYS toothpaste and oral rinse actually breaks the molecular bonds to destroy the odor-causing VSCs. With regular use, CloSYS toothpaste and oral rinse can assure you of cleaner teeth, a healthier mouth and the freshest breath possible. Want to buy CloSYS in Mission Viejo? Dr. Milner recommends new CloSYS toothpaste and oral rinse that will help clean your teeth and give you fresher breath to keep you smiling for hours. Both feature the CloSYS ingredient, which has been proven to not just mask, but eliminate odor-causing volatile sulfur compounds on contact! Plus, the silica polishers in non-foaming CloSYS toothpaste help whiten teeth with regular brushing. CloSYS toothpaste and CloSYS oral rinse are not simply more “cover up” products, but a revolutionary new cleaning technique. Your mouth will feel like it’s just been professionally cleaned by a hygienist. 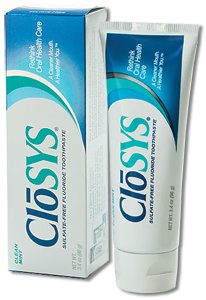 Originally developed by a periodontist for professional use, CloSYS toothpaste and CloSYS oral rinse are available only through dentists and dental hygienists. They contain no alcohol and are gentle enough for everyday use. Used together in a daily program of brushing and flossing, plus regular professional care, CloSYS toothpaste and CloSYS oral rinse can keep you confident that your teeth and breath will stand up to even the closest contact. And that’s really something to smile about! With CloSYS toothpaste and CloSYS oral rinse, your mouth will feel “dental office” clean every day! CloSYS Toothpaste contains the CloSYS ingredient (unique combination of chlorine dioxide and phosphate) to neutralize odor-causing compounds on contact, plus a special combination of silica polishers to help whiten teeth with regular brushing. CloSYS Toothpaste is one of the lowest in abrasivity of any toothpaste on the market, so it’s safe for daily use. The CloSYS ingredient is also effective at getting to the bacteria that cause gum disease and gingivitis. Toothpaste is a great addition to your homecare efforts, giving you a healthy mouth and fresh breath. Another unique feature is that CloSYS Toothpaste is one of only 6 toothpastes that does not contain sodium lauryl sulfate, which has been linked to canker sores. Tooth whitener when used on a regular basis reduces stains caused by food, wine, tobacco, coffee, etc. 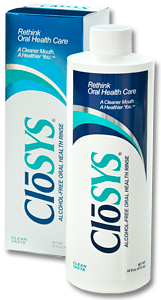 Use CloSYS Oral Rinse after brushing for unsurpassed control of your bad breath and for healthy gums. Unlike traditional mouthwashes, pH balanced CloSYS Oral Rinse does not rely on an added flavor to cover bad breath. The CloSYS ingredient actually eliminates the compounds that cause odor at its source, throughout the mouth. Over-the-counter mouthwashes just cannot get results like CloSYS Oral Rinse. CloSYS Oral Rinse also contains no alcohol, unlike most mouthwashes. Alcohol actually dries the mouth, and once the flavor’s effect is gone it will make your breath worse. The CloSYS ingredient also helps to control the bacteria that cause gum disease and gingivitis, a great addition to your oral home care for preventing or controlling gum disease. You get a winning combination of a healthy mouth and fresh breath with CloSYS Oral Rinse. Unflavored CloSYS Oral Rinse can be used as is, directly form the bottle, or if you prefer a flavored rinse, you can add the accompanying mint flavor according to package instructions.